The pre-show lasts approximately 30 minutes. The show price also includes pre-show admission. Red Skelton: A Performance Tribute By Tom Mullica is no longer playing in Branson, it is unknown if or when it will return. The legend of Red Skelton continues with this side-splitting homage to the timeless comedian The Legend Continues, performed by Tom Mullica, who was a close friend with Red for 18 years! 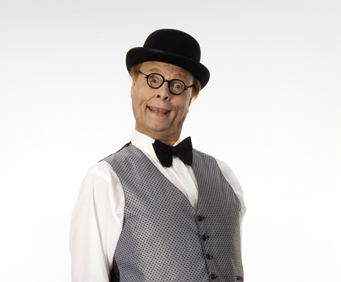 Tom Mullica astounds and wows audiences by how well he has become liken to Skelton. 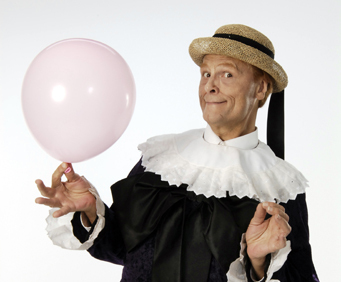 For over 17 years, the talented impressionist, comedian, and magician has been paying homage to Red Skelton, an international icon of comedy, with this entertaining production. Mullica has been polishing this act, becoming a spot-on impersonator of this comedic legend! When Tom met Red and was given permission to use his material, he jumped on the opportunity and began performing all over North America, Europe, and Japan. His amazing transformation into America’s Favorite Clown takes audiences on a hilarious jo8urney back to a simpler time when families would gather around their television sets and share in the laughter of Red’s famous comedic characters – characters like Clem Kadiddlehopper, the Mean Widdle Kid, and Freddie the Freeloader that Tom Mullica beautifully and hilariously recreates! A patriotic moment that certainly pleases the crowd is when Tom recreates Skelton’s “Pledge of Allegiance” skit. This wonderfully endearing segment is sure to warm your heart. Generations young and old will admire this memorable tribute. Some may be reminiscing about one of the most popular comedians, while others grow fond for the first time. 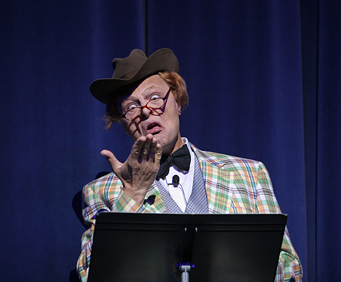 All can be happy and proud knowing that the legacy and laughter of Red Skelton lives on in the artistic and comedic hands of Tom Mullica! Acclaimed as one of the world’s greatest comedy magicians, Tom Mullica is a one-of-a-kind entertainer whose acts could never be duplicated! He has been featured on many national television shows, theater venues around the world, and is regarded as one of the greatest variety acts of our time. Tom Mullica’s talented performance takes the art of imitation to new heights! Tom is the most under rated show in branson. I don't think people appreciate true comedic talent as much anymore but tom as red is not to be missed. He is a 1st class acting talent and he was fabulous. We enjoyed this show the most! I had no idea who red skelton was before attending. My husband wanted to attend. I was crying from laughing so hard! This was simply a wonderful hilarious show! "We attended the show in sept."
We attended the show in sept. Of this year and really enjoyed the show. You had good clean laughter and lots of tears from laughing so hard. We heard this is the last year tom mullica will be preforming. This was the second time we have seen this show. It was very entertaining and it is amazing how quick tom is able to interact with the audience. Our seats were very good. This show brings back many good memories.